We also have on sale one other RO. For DIY use - Clack Microline reverse osmosis. Made in USA. With a 5 year Clack warranty. Supplied at the best RO price. Reverse osmosis from €199. In the box only. Aquaphor and Clack have the longest official RO warranties. All other RO warranties are typically 1 year. Far east manufacture. Short life. Reverse osmosis has a long track record for safe drinking water. It allows hyper-filtration of a ten millionth of a millimetre particle size. Or 0.000001 Micron. Most common filters employ particle removal of 0.02 - 0.001 mm. Or 20 micron to 1 micron. As opposed to the RO 10,000th of a micron filtering ability. Reverse osmosis systems employ pre-filter cartridges. And cross flow membranes. With multiple filter stage combinations. We supply reverse osmosis systems that are none electric. Yet allow common water pressures. Saving another €30 a year over pumped models. Aquaphor are the only RO company to offer hollow fibre ultra filtration. And multiple stage silver carbon cartridges. For extreme bacteriostatic ability. Galway Water are the only importer to buy direct. From from these leading RO manufacturers. We import, distribute and install reverse osmosis. In 1748 French Scientists. They found pig gall bladders could permeate water. In 1861 Graham. He first observed the osmosis principle. In 1903 Morse and Pierce. They use electrodes for dialysis. In 1906 Bechold. First made an ultra filter membrane with 0.01 micron size. In 1913 Abel. Suggests the idea of the use of hollow fibre dialyser. In 1943 Kolff. Completes the idea of an artificial kidney. In 1950 Dr. S Sourirajan. Invents an artificial bio selection osmosis membrane. The basis of reverse osmosis. In 1953 Reid. Starts reverse osmosis research. In 1959 UCLA. Develop reverse osmosis in California. In 1960 Loeb & Sourirajan. Make the first acetic acid fibre reverse osmosis membrane. It has high water flux with high salt removal. The first RO plant produced 22 m3 per day in 1965. By 1970 commercial ventures flourished. Filmtec started operation - now the worldwide Dow Filmtec. Submarines and space craft had an effective way of desalinating and recycling water. Sub ocean and outer space travels allowed for longer missions. In a way, RO was a key military development of the cold war. Reverse osmosis is the fastest growing form of sea recovery desalination. There are 3,000 large reverse osmosis plants. Each producing 4,000 cubic meters. (4 million litres) of drinking water daily. From a total of more than 12,000 municipal desalination plants. 30% of global desalination. Producing more than 40 billion litres per day. Growth of world population is now an issue. And the need for fresh water supplies are now more acute. The technology of reverse osmosis greatly improves reduced unit costs. The numbers of municipal reverse osmosis plants are rapidly growing. With significant improvements being monitored for ideal water balance. The trend of municipal reverse osmosis has been followed. By organisations such as the World Health Organisation. Recent reports give major backing for RO benefits. Large and small scale RO plants offers the world a future. On a planet of ever diminishing natural fresh water resources. Where access to infinite sea water and inland water sources has major untapped potential. Reverse osmosis is becoming a way to solve the world's water shortage problems. Typical reverse osmosis systems are based on 95% mineral removal and 99.9% heavy metal removal. They allow mineral balance, say 20 ppm on a water hardness of 400 ppm. Many of brands of bottled water have under 20 ppm of calcium. Either way there are 100% of usable minerals in food. Also modern RO systems now offer extra options for minerals if chosen. Bottled water can be 1000 times the cost per litre of municipal tap water. And has a massive carbon foot print. And land fill concerns. Reverse osmosis is great for chlorinated / fluoridated tap water. Or suitable borehole well water feed sources. They filter these to high levels of quality and safety. Yet without the carbon footprint concerns. And with costs of one tenth to one twentieth of bottled water. Domestic and commercial reverse osmosis has been in use for over 4 decades. It is the fastest growing acceptable, safe water technology. Reverse osmosis systems are the only water filter systems able to remove impurities at the hyper-filtration range. Properly specified reverse osmosis systems provide chlorine removal at 100% and the efficient removal of sodium. Also toxic metals, nitrates, fluoride, cryptosporidium and bacteria. And an extensive list of other harmful parameters found in water. RO systems can deliver minerals above 20 ppm without modification. Depending on original water hardness. And can raise mineral content to levels ten times or more. Using mineral cartridges which are rarely if ever required. Reverse osmosis pre-filters are changed every 1 to 3 years. RO membranes last from 3 to 8 years. Depending on the water source. And can be tested at anytime for true performance. See our full list of water softeners. Iron and manganese water filters. Odour and colour removal water filters. Grit and turbidity removal water filters. Ultra violet sterilisers. 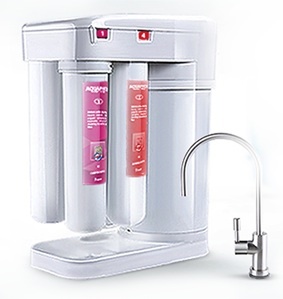 Reverse osmosis water filters. And other specialist water treatment equipment. These are found in our pdf brochures on the home page.